If you just need to run a batch of numbers from a file and don't want (or need) to integrate with our API, we provide a simple desktop client application to run a CSV data file through our number portability lookup service. 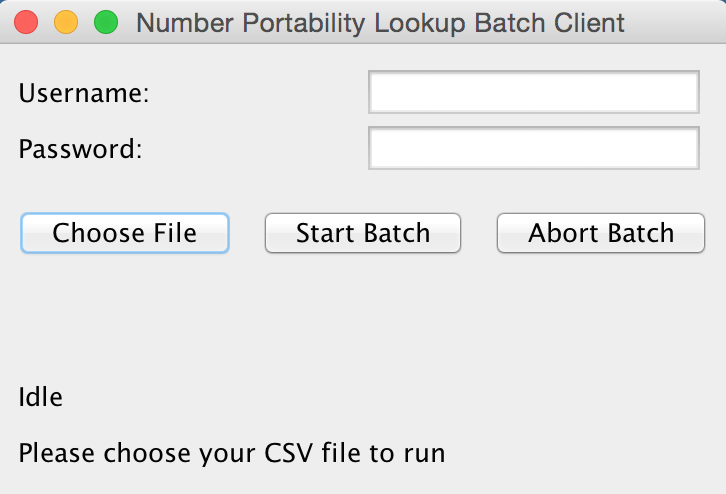 The Number Portability Lookup Batch Client is a Java application and is compatible with Windows, Mac, or Linux. Your number list should be in a textfile (one per line), or CSV file. If using a CSV file, the number to be queried must be in the first ("A") column. Please test one or two numbers to make sure everything is working correctly before starting a large batch. Once you have Java installed, double click on the NPL.jar file to launch the desktop application.